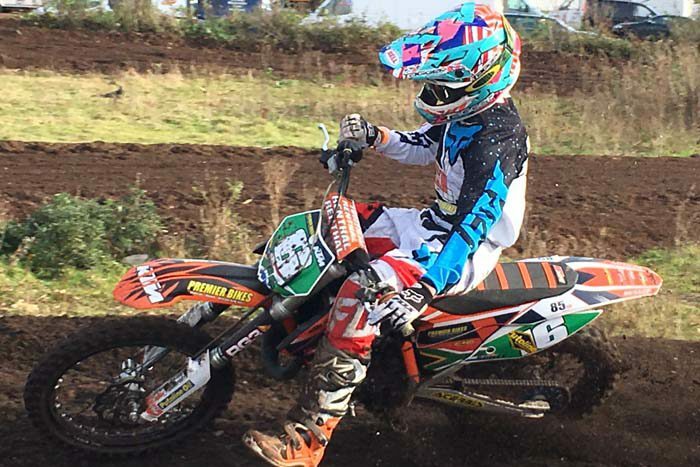 Cullen Scott, (14), a Year 9 student at Gillotts, continued his winning streak last weekend with a 5th straight win in the East Anglia winter motocross series. Cullen took up motorcross when he was 4 years old on a 50cc bike when he lived in South Africa following in his father’s footsteps (Clint Scott) as a motorcross rider. On moving to the UK in June 2014, it meant Cullen could focus on making a career in motorcross as the world championships are mostly around Europe. Over the past two seasons Cullen has competed in the British National Championships and has now established himself as a top contender for the 85cc BW 13-15 national Title. He also competes in selected international events and last year qualified Gold and finished 9th in the final at the Master kids world championship in France. He has won many events over the last season including a district championship and in preparation for the upcoming nationals, he is currently unbeaten in the East Anglia winter champs with 5 from 5 wins and three races remaining. The first National event takes place on the 18/19 March at Culham Oxfordshire, a home track for a change so he is hoping for a great result to kick off the season. Cullen would like to thank his sponsors, Abil Office Solutions, RG3 Suspension, Premier Bikes Didcot, Putoline Oils, Fro Systems UK and M-tech.